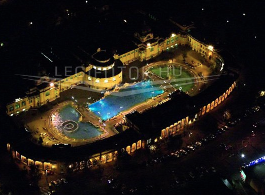 This highlight of this August at Szechenyi Baths was the space themed spa bath party with awesome acrobats, fire and water shows, party DJs and VJs, laser rays on the walls of the palace of Szechenyi Baths. 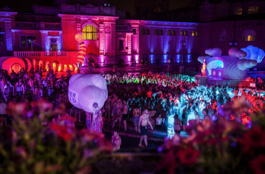 If you missed the sparty in August, here is a video taster to feel what you missed (unfortunately the soundtrack is not the best quality, but hopefully you will get hooked by the visuals). 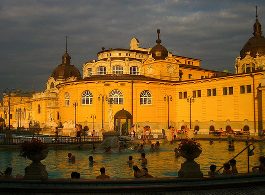 You may have a chance to be part of these one off incredible Cinetrip parties on New Year’s Eve or New Year’s Day, if not, schedule your trip for the summer (Cinetrip party maybe next August, when the Sziget Festival is coming to Budapest in 2013, and more simple Szecska bath parties all summer on Saturdays). 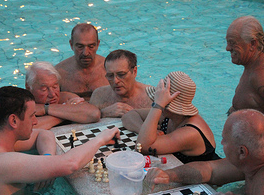 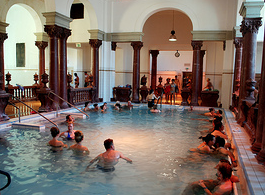 Previous When is the next Szechenyi Bath Party in 2012?